Newly injured patients and their families now have access to two new DVDs, Understanding Brain Injury and Understanding Spinal Cord Injury, produced by Shepherd Center and created by an Atlanta-based communications firm. The series, now available for purchase, educates viewers about brain injury and spinal cord injury (SCI), offers advice on coping and outlines possible functional expectations for the future. Shepherd Center partnered with the American Trauma Society, the National Spinal Cord Injury Association, the Brain Injury Association of America and the Christopher & Dana Reeve Foundation to raise awareness of and distribute the series. 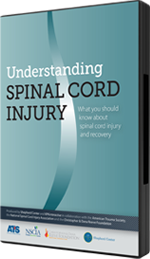 This DVD features some of the nation’s top neuroscientist, physicians and spinal cord experts to help you understand spinal cord injury. This DVD features some of the nation’s top neuroscientist, physicians and brain injury experts to help you understand brain injury and recovery. The two educational DVDs – one serving as a practical overview of spinal cord injury and the other as a practical overview of brain injury – speak directly to recently-injured people and their family members in the acute care setting. For large bulk quantities, please email us.